“There is no greater love than to lay down one’s life for one’s friends,” let alone a stranger, a divine truism symbolic of the foundational bonds that link our nation. Nowhere has that love been more vibrantly expressed than in the selfless sacrifice of our nations firefighters. These brave men and women live and serve in all our hometowns and communities. 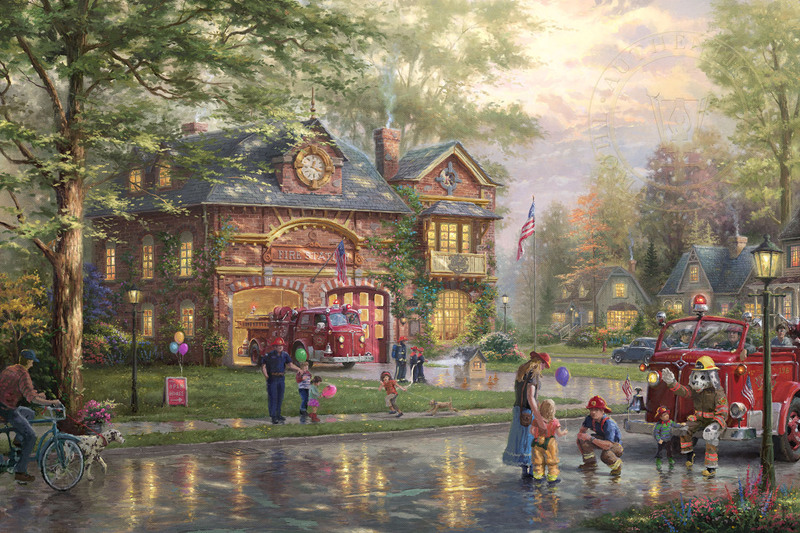 Thomas Kinkade Studios is honored to recognize the heroic firefighters portrayed in the newest painting – Hometown Firehouse. As parents and children from the neighborhood gather on the lawn of the firehouse, there is a sense of family and support that boosts the firefighter’s morale; their sacrifice has been noticed and appreciated. Their long shifts, time away from their family, and the dangers of the job can be stressful, but today is the annual open house at the fire station, a chance for little boys and girls to meet these real-life superheroes up close so that maybe one day they can be just like them. For the children, open house at the fire department means balloons, stickers, and their very own replica firefighter helmet, but others have simply come to thank them for their tireless efforts. The bright cherry-red fire trucks that sit out on display garnish much attention from children, as they examine every light, siren, and bell. While a few firefighters demonstrate the proper way to put out a fire, the firehouse mascot pats the kid’s helmet-clad heads who stare in disbelief at the enormous pooch. 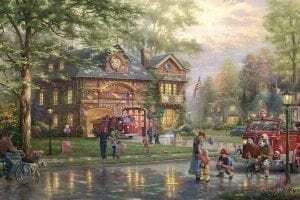 There are many tributes to Thomas Kinkade within the painting as well, such as the “K” on the firehouse and the three traditional Kinkade light posts.